Having settled on the quartered 12×12 grid as a reasonable solution to the problems of the last on that list, the hunt was on for a way to justify it in a way that would still present an interesting puzzle. The four natural elements was an .. er .. natural candidate but it was only when I realised that it was possible to represent them best by emphasising the difference between them using a unique method of entry for each of the four quadrants that it really started to come together. One problem, remained, of course. How to ensure that the entries were placed in the correct quadrants. I thought I remembered from my days studying Chaucer that the elements were linked in some way to the ‘humours’ and was very pleased to have this confirmed by a Wikipedia article. Although it gave me all I needed to complete the puzzle this would actually prove to be a stumbling block as after submission it became apparent that the direct link that the ordering of the quadrants relied on was not verifiable by any of the standard reference works which Listener solvers are assumed to have available to them. In keeping with its somewhat chaotic beginnings, it was only a piece of quick-fix thinking in providing the pre-highlighted cells in the grid that rescued the puzzle from banishment to the place of wailing and gnashing of teeth. Still they do say that every beautiful swan swims with grace only because of the furious paddling out of view! Definitely one of the harder grid fills of 2017. The clues and vocabulary alone were pretty tough in places – eight new words for me, including ANNATS, ALCINA and the deceptive RAMSON. I’d solved only eight or so clues then departed, puzzle-free, for some walking in Snowdonia. Returning mid-week I then started seriously on it. First of all, 28 clues? Fully populated it would appear to need 48 clues, though ‘no Down clues in one quadrant’ appears to reduce that to 42. But 28?? I experimented with the clue type I’d solved most of, those with a single letter deletion, and soon came up with a 6×6 that used up the five words of EARTHY, AFARAS, TRISTE, HASTEN and YSHEND that I’d found so far. It turned out that this was a clue needing a letter deleting before solving – in this case the m of ru(m)ble to become ruble. The wordplay is DI (a plural of DEUS that I wasn’t aware of), in R(uble) + ASH. Easy, eh? The symmetry of that square apparently reduced the number of clues required down from 42 to 36. By this stage CHOL* and something like MELANCHOLY had begun to appear from the ‘letter-per-clue’ feature. Also the quadrant containing WATERS and MEADOW (echoes of an early Pink Floyd reference hiding in there, surely? *) had started to fall into place, reducing the apparent need for clues down to 30. So I assumed FIRE / EARTH / AIR / WATER had to be top-left in each quadrant and adjusted theme accordingly. I needed to look up which related to CHOLER etc. to get the order right. I finally combined what I has so far into the final quadrant which appeared to need NOOREA and LRAOVE to be words unless there were bars in place, so I (logically at least) added them. Another two less clues required, thus 28 justified at long last! I’d spotted the gently evolving FIRERS -> FARERS etc. but this stage, but that did leave me slightly puzzled about Quadrant 1. If it has no down lights then doesn’t it need loads of bars as well? I tried offsetting each of the horizontal words just in case it allowed vertical words to form. No luck, so I left it as is and posted it off with a string feeling I’d missed something – well, it wouldn’t be the first time! Thanks again to Flying Tortoise – I do like the more challenging Listener puzzles! *Talking of Granchester, and as a fan of longer anagrams, I can’t resist repeating that glorious clue of Araucaria’s here. “Poetical scene with surprisingly chaste Lord Archer vegetating (3,3,8,12)” which gives THE OLD VICARAGE GRANTCHESTER, by a wondrous chance Jeffrey Archer’s home. ‘Oh dear, what can the matter be? Johnny’s so long at the fair.’ Surely that doesn’t provide a theme for a Listener crossword (but who knows – we might end up with a bunch of blue ribbons wrapping the grid). No, it’s more likely to be some other kind of matter to insert into this carte blanche grid divided into quadrants with a six-letter word that is going to fill those helpful circles. A mere 28 clues too. Now that is worrying as a grid this size would normally have at least 36, probably nearer 40, but we are told that there are ‘no down clues’ in one quadrant – we are still about twelve short. I wonder whether we are going to have two quadrants that use that word square gimmick (I don’t know what it’s called but it is very clever – a particularly remarkable example is the SATOR square in Luberon) of using the six words in both directions. Nothing to do but solve and see. Well, there is one thing to do – check the alcohol. I remember Flying Tortoise from his Leaning Tower of Pisa puzzle where we had to cut out two squares to demonstrate that a large and small object would fall simultaneously. He certainly confirmed his membership of the Listener Tippling Outfit with a few alcohol references in that one, so does he retain it? I read through the clues finding pâté and some more ‘matter’ but only ‘Measures of use to ge[M]ologists assessing the subsoil primarily after steep slope is stripped (6)’ There’s a lovely surface reading there (as there is in all of these carefully crafted clues) which eventually gave us (s)CAR(p) + ATS (initial letters of Assessing The Subsoil). Those had to be CARATS (no very useful alcoholic measures!) I’m more hopeful when I find ‘The sack about to be hidden in trees (6)’ – Sack, is, of course, an older form of sherry – but no, this time it’s RE in FIRS and that gives FIRERS – ‘TheY sack’. Fortunately I then find ‘Generally more accessible first episode (6)’. It takes a moment to work out what the ‘Generally’ is doing there but then I realize that must be just a normal clue, that somehow has to have the letter G at the start, as it gives ‘OPENER’. I think if Flying Tortoise is opening things, he can have the benefit of the doubt. Cheers! Sure enough, we now find that we have one of those word squares, which explains the paucity of clues. With delight, I find that another six clues create the WATERS quadrant if we enter the down words upwards. It is going well. 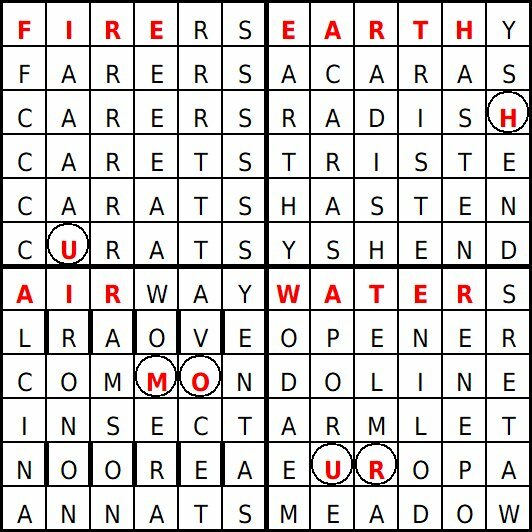 We have nine clues for the AIRWAY quadrant and happily enter AIRWAY, IRON-ON, RAMSON, WOMERA, AVOCET, YENTAS, COMMON, INSECT and ANNATS but are rather puzzled by two non-words that are appearing – until I read that ‘bars would be appropriate in only one quadrant (and need not be shown). So this is the quadrant! We are left with the quadrant that has no down clues but we are expecting down words to appear when we insert FIRERS, FARERS, CARERS, CARETS, CARATS and CURATS (for which the place is fixed by that U). Of course, what appears is a string of Rs and Ss and, for a while, we are flummoxed until we see that we are changing a single letter with each new word. There’s a sequence here. I am surprised that there seems to be no justification of this in the preamble, but I imagine the setter and editors thought that would be giving too much away. Quite a challenge from the Flying Tortoise, thank you. Last year’s FT (that’s, Flying Tortoise, obviously) had us cutting and pasting our grids into a representation of Galileo dropping balls from the Leaning Tower of Pisa. There didn’t seem to be any hint at grid mutilation this week, just a simple 12×12 carte blanche divided into four quadrants. Moreover, the preamble was very mysterious about what went into the quadrants: one didn’t have any down entries and another had them reversed. Each quadrant had a different clue type: normal, misprints and extra/missing wordplay letters. Which went where was another mystery since we were presented with a single list of clues. So, twenty-eight clues altogether and I solved a dozen of them on a slow pass through them. Alphabetical order of answers gives enough information to be able to narrow down the initial letters of remaining clues. However, for clues 3, 4, 6, 7, 8, 9 and 11, I had ALCINA, ANNATS and AVOCET followed by CARATS, CARERS, CARETS and CURATS and a couple of other C words. Something strange seemed to be going on here. My guess was wrong. [Told you. Ed.] This was finally revealed when I solved clue 1 Until Sabbath cleaves trees. It was a mystery which clue type this was: normal, with S splitting trees; cleaves becoming leaves; trees becoming threes; or until becoming untie! It was the second of these with AS FAR AS – S leading to AFARAS. This gave me a C letter removed, and I saw Choler spelt out by the clue letters in sequence. Checking Chambers, “one of the four bodily humours” was there for all to see. The problem then was “What were the other three?” I could see that Melancholy was probably the second, but I confess that I needed to google to get the others, Phlegm and Blood (here bloody). This enabled me to slot HUMOUR in the four circled squares, and I managed to slot words in where they fitted. I was sidetracked for quite a while by trying WOMERA backwards in row 3 of the south-west quadrant. That was before I sussed clue 10 Gentlemen bitten by striped carnivore — that’s gross grass for everybody, leading to COMMON. It didn’t take long to see that EARTH and WATER were were in two of the entries, and then AIR and FIRE. A bit more reading revealed that these elements (the preamble even told us that) were associated with the humours, and this confirmed the placing of the quadrants, although the circled squares had already done that. The four humours were also used to determine an individual’s characteristics. So, we had the EARTH quadrant in the north-east, with the same entries going across and down; WATER in the south-east, with entries going across and up; and AIR in the south-west with a normal mini grid with bars (not required). That just left how to enter FIRE in the north-west corner. It obviously started with FIRERS and ended with CURATS. The others could then be placed one after the other with one letter changing to give the word below. However, although this seemed obvious, there was nothing that I could see that determined that this was the required solution. All in all, an enjoyable and educational puzzle. Thanks, FT. I leave it to others to determine my humour! This puzzle has taken a while to get to publication – I started work on it in November 2012 having thought the phrase “man is the measure of all things” might be promising. I had the idea that the phrase had originated with Leonardo da Vinci and his Vitruvian Man drawing, which of course a quick bit of research showed was wrong, but the idea of revealing the author as a stick man in the grid still seemed a good one. I constructed a grid, wrote the clues and sent it off in January 2013. At that point it was called MISTIME – M(an) IS TIME was the idea. I heard back on it in August last year – I had sneaked a quick turnaround with Reductio ad Absurdum in for early 2015 so this one was justifiably pushed back in the queue. 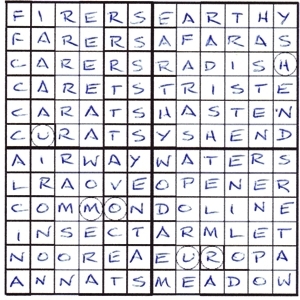 The editors thought it was promising but the grid didn’t work, with an average entry length of 5.1, so proposed an amended grid which required rewriting the majority of the clues. While I was working on that, King’s Album also overtook it and was published about this time last year. The reworking was completed and sent off in September last year and also included a change to the puzzle title as MISTIME hadn’t been considered much help by the editors. I came up with MISS ALISHA JOHNSTON – M(an) is S(econd), AL is HA, JOHN’s TON. When the feedback came back this year, the editors didn’t think much of that — quite rightly: with hindsight, even I can see I was trying to be too clever – and came up with the much better idea of Rod and Bill. I think it’s fair to say the reaction has been mixed. The theme and the final grid worked for most, but the clueing was too simple for many and then of course there was the ambiguity over the correct entry for 34dn. DAN is what I intended. I was aware MAN was possible but thought that could be ruled out as names were clearly used elsewhere, but I hadn’t realised that CAL could also be a valid name. Apologies for my ignorance and any annoyance caused to those left wondering if they had the right answer. With hindsight, I should have done more to make sure at least two of the letters were checked in this grid, as they were in my first version of the grid. Thanks to all those who sent feedback – it’s much appreciated.